When the opportunity arose to be a part of this special day for 2017 – this time to be held at Holdenby House on Sunday 22nd October – I jumped at the chance! And boy, was that a good decision! The day was simply brilliant – and made me proud to be part of such a vibrant community. There were foodie delights, beautifully made crafts and decorations, beers and ales, simply stunning falconry displays, archery, balloon modelling, face painting – even ferret cuddles and racing!! We were fortunate with the weather being on our side – an unexpectedly cold but crisp day of blue skies, sunshine – and some crazy winds thanks to Storm Brian, but none the less the people poured in for a day of fun, heritage, history and merriment! With approximately 2,000 people coming in through the door – I was lucky enough to meet some amazingly interesting people, make new friends and understand a small slice of just what our county has to offer! The Crafty Lass stand was demonstrating making fabric tinsel and wreaths – ahead of the upcoming Christmas craft workshops – and also briefly appeared both live on BBC Radio Northampton with Carson Wishart and for a short stint in the ‘Talk Tent’ discussing just how important craft is – and how it can be a therapeutic opportunity to relax out of our busy working lives. 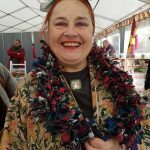 A particular shout out and thank you to the wonderful Elke Pollard who I met today and loved my craft demonstrations of fabric tinsel so much she bought the demo make to wear as a scarf! What a trendsetter! Thank you to everyone who came along, watched the demonstrations, bought from The Crafty Lass (our greeting cards and some beautiful fabric fat quarters were for sale!) and were excited about coming along to the craft workshops! Also to all the other lovely producers and traders who I met today. 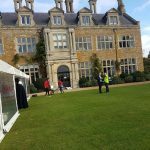 Finally, a MASSIVE thank you to BBC Radio Northampton and Holdenby House – what a fantastic event you put on! See you next year! 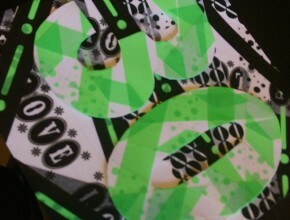 And keep checking back – as there will be some exciting new designs coming very soon…! Yes, I know it can be commercial, and yes it can sometime’s can also be tacky and yes – just an excuse for you to HAVE to spend more money on your dearest loved one. But, that is kind of the point? I feel I can say I love you to The Husband on any day of the year – and, I do buy him little gifts for random meanings and occasions (and yes, he is lucky, right?) and not just because it’s a ‘special day’. However, I do like that it is a very specific romantic day of the year where, should you desire – tell the person you love, secretly – or not, declare the reasons you’re with that important person in your life, just make someone feel loved and special. Anyway – one thing I do always feel is important is to give a card. Now I know what you are thinking – well, you would say that – you sell your own greetings card range! But, precisely – that is part of the reason I designed greeting cards in the first place. They aren’t just a bit of paper – they allow you to express your thoughts and emotions inside! (By the way, you can get a special offer at the minute – FREE delivery on all orders on The Crafty Lass greeting cards on our Etsy store with code TCLVAL16!!) Enough of plugging the promo, and back to the real point. I just think that the opportunity to pen a few lines to your other half, your special one, your snugglekins (!) can be a special moment. I wouldn’t ever expect a blank card to be completed with “Dear Janet, Love John x”… What, that’s IT?? You need to put some effort into it! Maybe I should be grateful of a card at all – and it certainly sounds upon reading that I am a crafty little Valentine’s diva – but I certainly keep my ‘special’ cards in a shoe box for ever more, to be annually, or perhaps decadely reviewed every now and again with an ‘awwww’ and fuzzy feeling moment – so you had best be writing something that little bit more emotive!! For those that already do this – high five. Just take the opportunity whenever you can to just make someone your focus and let them know you care, however that might be. If you are planning to MAKE a card how about this lovely DIY embroidered card idea! Craft knifes at the ready! If you are buying a gift for the special someone – what a simple, but ever so effective hearts gift wrapping idea with the red and brown paper. There are two ideas in one here, as they also offer a creative stamping effect too – simply using a pencil eraser! 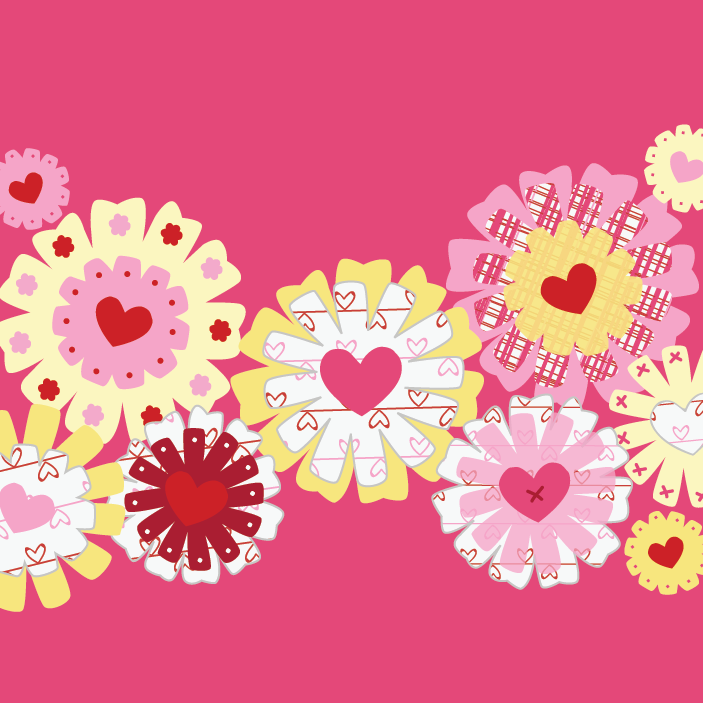 Another gift wrap idea here, but could also be used as a decoration garland afterwards! Cute, again – simple but effective! If baking is your thing (you can’t beat a bit of baked goodies to certainly make someone smile) what about this lovely chocolate shortbread and sprinkles idea. There is also a good US measurements converter here at Good To Know. You’re welcome! Still on the baking theme – just how amazing does this hearts cheesecake look?? It must be SO satisfying to make that swirl… wow! 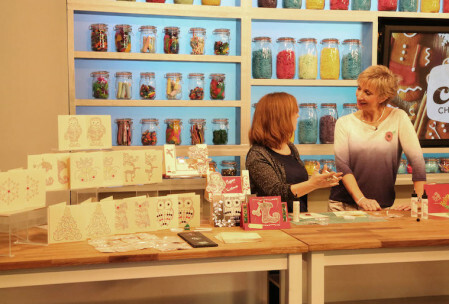 The Crafty Lass Christmas cards… As seen on TV! Today is the start of The Craft Channel’s new FOWO (For One Week Only) promotion – a fantastic crystal card kit, a very therapeutic craft – almost like ‘painting by numbers’ except more crystal glueing by numbers and letters…Some amazing designs and good value too! 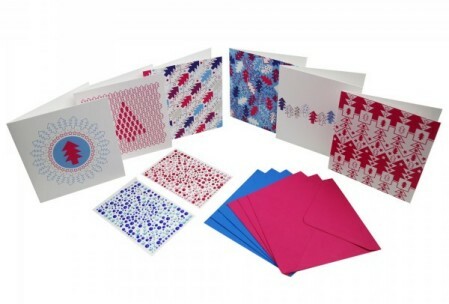 As part of the FOWO programme myself and Katy John look at all manner of card creations including some simply amazing pop-up cards – you can actually decorate a 3D Christmas tree and send in the post! Some laser cut greeting cards that you can ‘bling up’ with glitters and gems to your hearts content… and lastly (but not leastly (is that a word?!)!) 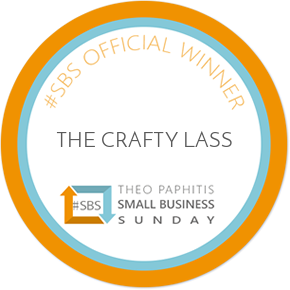 – The Crafty Lass greeting cards also feature in this programme! A new addition of 650 self adhesive gemstones in vibrant pinks, turquoises and blues are also included to personalise them for yourself and add some glittery bling! And of course, colour coordinating envelopes too. I really like this idea – that you don’t have to take a greeting card at face value – if you like a design, but think it needs something extra – just jazz it up with some additional decoration! 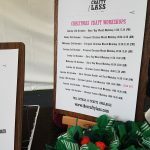 Now of course, I am going to say this – but I think The Crafty Lass Christmas cards, are lovely just as they are – but I do also like them with a few gemstones here and there to make extra EXTRA special. The FOWO programme is airing at multiple times across the week – please check out our latest schedule on the below channels. Enjoy! The Crafty Lass does… TV! That’s all this post needs. If you had asked me 1 month ago a) would I work for a shopping channel on Sky in the buying team and b) would I do the on air demos?? I would have laughed in your face. 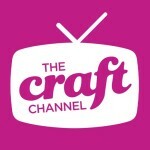 In fact, what I will do instead is tell you to tune in to Sky 660 at various times across this weekend for The Craft Channel’s ‘Festive Weekend Wonder’ with The Crafty Lass. Crazy right…?? 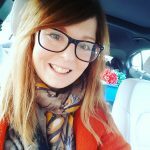 Once again, I apologise for the lack of recent blog posts – but in reality I basically have enough time at the minute to make sure I am eating, sleeping (albeit less! ), commute to London to The Craft Channel, try and stay in touch with loved ones, and of course some crafting… And the odd bit of gym/socialising/nails being done for the camera (!). The point I am trying to make is my schedule has become ‘complicated’. Ha! 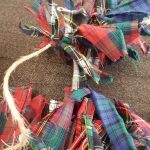 I have always been crafty (as we know on this blog – the clue is in the name!!) and I have in the past been into theatre – a regular in the local am dram scene where I grew up in Sunbury-on-Thames at Riverside Arts Centre – however, I am not sure I was prepared for TV! Well, perhaps prepared is the wrong word – expecting?? – basically, it felt natural, but I do also feel – how did this happen?? It’s the start of things to come…. The Crafty Lass does… Christmas Cards! Ho ho ho! Meeeerry Christmas! 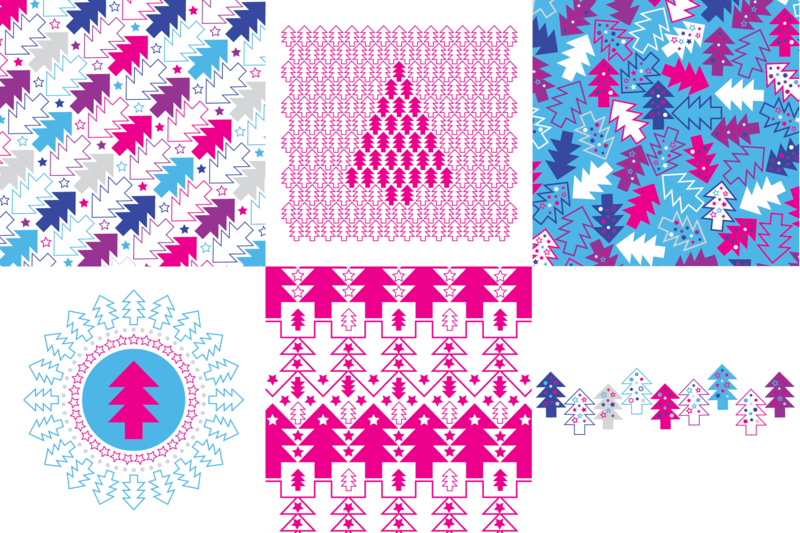 Ok, it is only October… however, why not get ahead and get your The Crafty Lass ‘Graphic Brights’ Christmas Cards…on sale via my Etsy shop NOW! All cards printed on thick, luxurious ‘Omnia’ board. 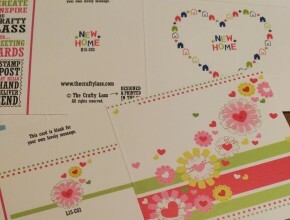 Multipack of 6 (1 of each design) only £9.50… therefore only £1.58 per card! 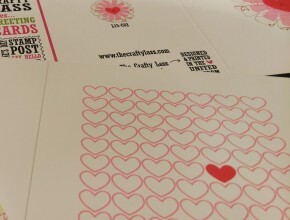 The Crafty Lass does… 20% off promotion! Promotion time! To celebrate the launch of ‘The Crafty Lass’ online Etsy greeting cards shop – there is now a lovely 20% discount off all orders between now and the 30th September! 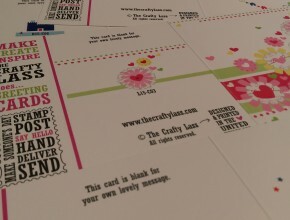 The Crafty Lass does… Online Greeting Card SHOP! The moment you have all been waiting for… well, what I have been waiting for pretty much my whole life. Today is a big day in The Crafty Lass journey. It has always been my absolute dream to (a) start my own business (b) this be in craft and/or design and finally (c) have my own online shop selling greeting cards. 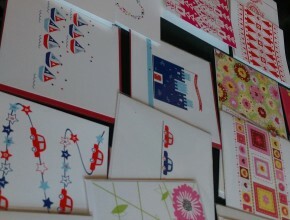 Greeting cards are a really important thing to me – we all send/give them regularly – and they mean an awful lot! Just how special do you feel when a little brightly coloured envelope lands on your doormat and you know that someone has taken the time and effort to 1. select a card, 2. hand write it and 3. send it to you – maybe for a special occasion, or perhaps just to say ‘hey’, ‘sorry’ or ‘I miss you’. Even better when it is hand delivered! Whatever the reason, whatever the words inside – it is always special to receive a card. With today’s multitude of ways to communicate – texting, emails, Facebook, Twitter, Instagram, Pinterest, WhatsApp (to name just a few!) – there is still a love and desire to send a REAL bit of post. A hand chosen card, with a lovely little note inside – it means far, FAR more than just sending a quick text message. The GCA Greeting Card Market Report 2014 reinforces what a huge and successful industry this is with £1.29 billion spent on single cards in the last year – more than tea and coffee put together. More cards are bought per person in the UK than in any other country – 31 per person an astonishing 884 million single greeting cards were bought from retailers of all shapes and sizes in 2013. For more simply amazing Facts and Figures about the UK card industry, check out the Greeting Card Association’s website! 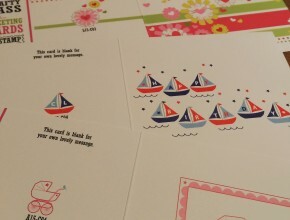 The Crafty Lass greeting cards are simple, (but effective!) modern designs, all lovingly created (over the last decade!) on Adobe Illustrator, by myself and printed on heavy, white Omnia board within the United Kingdom. All cards are left blank for your own lovely message – your own words always mean far more! Check out our full range HERE and our Etsy store HERE. 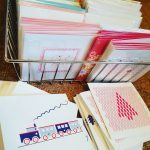 The Crafty Lass does… Greeting Cards! I have always loved design, stationery design in particular – and love nothing more than sending and receiving a traditional hand written card. Don’t get me wrong, I love Twitter, Facebook, Instagram, Pinterest and all other social media as ways to communicate almost instantly with the world what you are up to, what you have seen that inspires you. However, it does not beat a brightly coloured envelope landing on your doormat and reading a heartfelt message whilst curled up on your sofa with a cup of (Yorkshire) tea. Approve the proofs, order the envelopes, cellophane bags, and then the online shop and…sales! The Crafty Lass does… The Brackley Community Carnival AND The Great Brackley Bake Off! Saturday 13th June 2015 – a date for your diaries – The Brackley Community Carnival! The Crafty Lass not only has a craft stall in the ‘Craft Marquee’, selling my new greetings card ranges – (soon to be sold online, watch this space!) 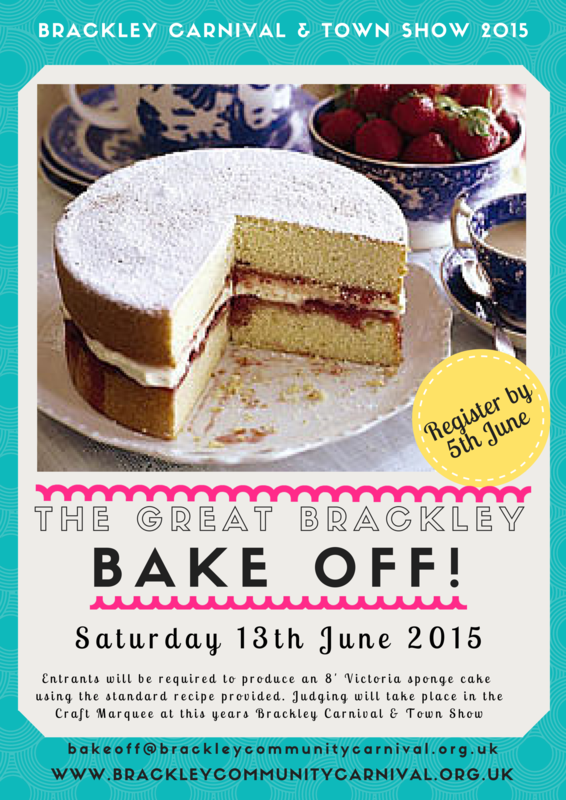 – I now also have a space in The Great Brackley Bake Off! I had best get practicing my Victoria Sponge…! The Brackley Community Carnival looks set to be a great day, check out the website for full details of events! 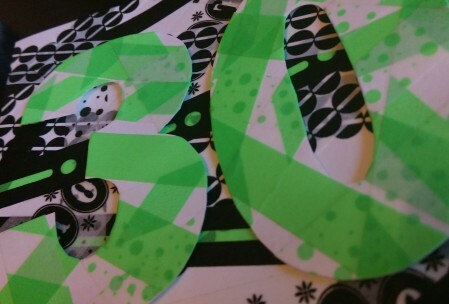 The Crafty Lass does… Handmade Washi Tape Birthday Card! A very simple card and craft, but I think with an effective outcome! – Print out, or draw the ‘3 and 0’, or a letter, or even a short phrase! 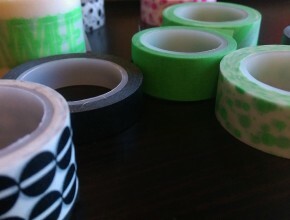 (backwards if possible so that no opportunity for lines to be seen when on the card) – cut out, turn over and wrap in washi tape! – Cut out a rectangle of card, in whatever size and shape you would like – and score down the middle so that the card folds nicely in half. – Cover the front of the card in alternative/contrasting tape to make sure you can see the numbers/font clearly and just trim neatly at the edges. 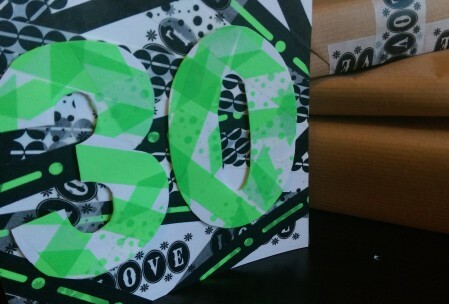 – I used some Sellotape sticky foam pads to then attach the numbers to the card so that they stood out slightly, but you could just glue straight on.